For over 25 years, McNeilus has been making the toughest refuse trucks in the waste hauling business. By listening to the feedback from our customers and constantly working to keep on the leading edge of technology, McNeilus continues to provide the reliability, performance and expertise you need to day in and day out. 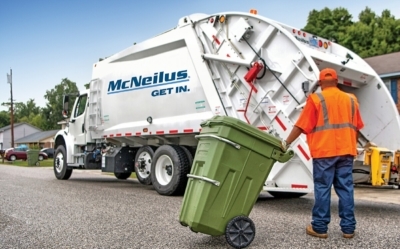 With a variety of models in all refuse truck types (Rear Loading, Front Loading, Side Loading), McNeilus trucks offer the reliable performance, low maintenance and innovative features needed for residential and commercial waste hauling operations. Both new and pre-owned trucks are available to match all your waste hauling truck needs.